Announcing Altmetric for Books at the Digital Science US Publisher Day 2016. You may have heard the exciting news on Monday that we have launched our very first book-related product: Altmetric Badges for Books. 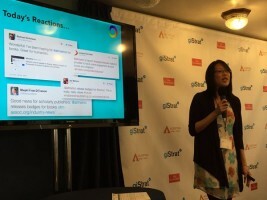 We made the announcement in a press release and during a presentation on at the Digital Science US Publisher Day event at the National Press Club in Washington, D.C. The service will be going live soon on the Taylor & Francis Routledge Handbooks Online platform. We’ve known for a long time that tracking attention for books and chapters is something that is incredibly important for a huge number of Altmetric’s current and potential users. For example, we’ve heard from Arts, Humanities, and Social Sciences scholars who told us that it’s incredibly difficult to trace the engagement and influence of their books and monographs. We’ve heard from book publishers, who want to show authors and editors richer information about their books, beyond just download counts and sales figures. We’ve also heard from commissioning editors, who want to find out which topics are hot in particular subject areas so that they can approach and engage with the most influential scholars. Our Badges for Books product has been almost a year in the making. In 2015, we began to support ISBNs (International Standard Books Numbers) as unique identifiers for books. We also started adding tracking support for a various book publisher platforms and catalogue pages, collecting attention data for books and chapters in these various platforms. In particular, we have now started collecting mentions of books listed on Google Books, across all of their 191 international domains (including books.google.com, books.google.co.uk, books.google.ca, and so on). So whenever Altmetric sees a mention of a Google Book URL in any of our attention sources, then the mention will be displayed on a corresponding details page for the Google Book. An example of an enhanced book details page, featuring a book cover image as well as a rich, clickable Table of Contents. As we started building up our coverage of book publisher platforms, we also designed two new book details page styles: the standard and enhanced book details page styles. The key difference between the two styles is that the enhanced book details pages actually link directly to chapter-level details pages from a rich Table of Contents on the left-hand side of the page (see example image). Starting in late 2014, a small team from Altmetric worked together with the then Springer team, headed up by Martijn Roelandse, to build their Bookmetrix platform. The platform (which at the time only included Springer books) saw Altmetric data fully embedded on book pages, along with citations, reviews, and downloads data provided by Springer Nature. Following the launch of Bookmetrix, we increasingly heard requests from users to build in greater support for books in Altmetric’s own platform. As such, it’s now possible for any publisher to embed the Altmetric Badges for Books on their own platforms – please get in touch for pricing and implementation info! 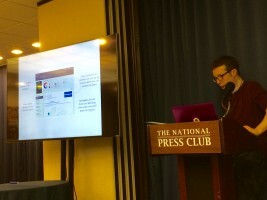 Altmetric CEO Euan Adie speaking about Altmetric for Books at the Altmetric Institutional Day in Washington D.C.
How is the Altmetric score for a book calculated? Now that we offer an enhanced book details page style which pulls book- and chapter-level details pages together in the same place, it’s important to explain how the resulting Altmetric score for a book is calculated. In fact, the Altmetric score for a book is calculated by taking into account all known mentions of a book and its chapters. 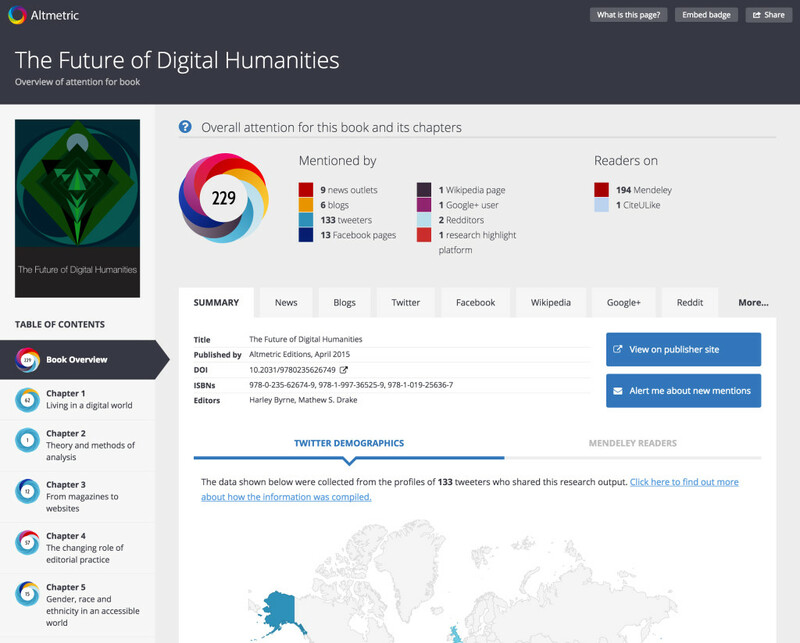 All mentions for a book and its constituent chapters are pooled together, and the Altmetric score is calculated as if the book and its chapters were a single entity. Essentially, we are treating the book as an aggregate of multiple outputs (chapters). If Altmetric is able to track attention paid to an individual chapter, the chapter will also get its own Altmetric score. Altmetric scores for chapters are calculated in exactly the same way as they would be for any other research output in our database. Please note that the Altmetric score for a book is not a simple sum of all of the Altmetric scores for the chapters and the book itself. To sum up the chapter-level Altmetric scores would be an invalid way to represent the book-level attention, as it would mean that authors or outlets that mention multiple parts of the same book then exert a much larger influence on the score. For more information about how the Altmetric score is calculated, click here. We plan to add further enhancements to Altmetric for Books in the coming months. Specifically, the next phase of our work on books will involve tracking more book-specific sources of attention, such as book review sources and listings of books in course reading lists/syllabi. We will also be adding deeper integration of books within the Explorer family of apps. If you’re interested in trying out the new book-related functionality when it becomes available, please e-mail us to register for our beta tester programme. What do you think of Altmetric for Books? Tell us what you think in the comments below.